U - FC - M series modular backwash filter is HNC introduced automatic filtering system based on modular design concept, with high reliability and flexible extensibility, automatic operation, durable, avoid artificial cleaning, very easy to open the maintenance, adopt unique V - HNC filter yuan, recoil thoroughly, less consumption of washing liquid.Filters can purify fluids, protect key equipment, after following the HNC high-performance, high-quality, high standards of the reliability of the design and manufacture, reached the international first-class quality. 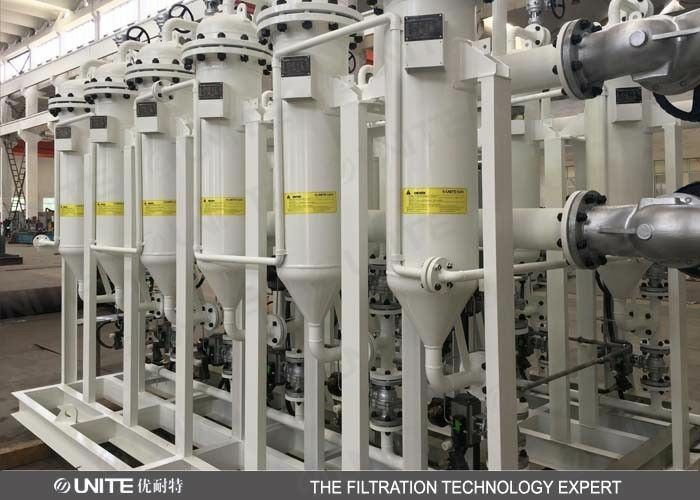 Mainly applicable to precision range 20-500 microns, suitable for water and low viscous liquid filter, but also good at micro fiber filter, oil sludge, soft agglomerate impurities, such as ordinary self-cleaning filter impurities is very difficult to do. Liquid flow from main entrance, into the entrance of all the filter units, liquid filtration yuan outside surface from inside extroversion, to export all the filter units, converge to the export manager after outflow, particle impurities were intercepted in the external surface of the filter element, accumulation of filter cake formation, when the filter pressure difference increased reaches preset (usually 70-130 kpa);Or cleaning cycle, then start backwash movement control system, for each filter unit one by one back flush, the whole recoil process is complete, when a filter unit is recoil, other units still normal filter. Backwash: the control system close a filtering unit inlet valve, open the back flush valve, because inside the filter element and backwash exports (atmospheric) connection between pressure difference, the other parts of the filter unit filter clearing liquid will flow to the filtration unit and quickly back flush filter element, the filter element washed away the surface impurities, the backwash main line, and then close the flush valve and open the inlet valve, continue to filter;Control system for the next filtration unit to perform the same back flushing action, until one by one back flush all the filter unit.